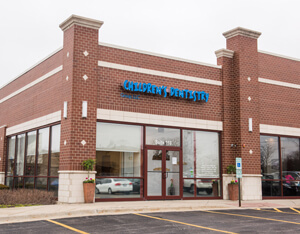 Our practice is located across the street from Paulus Park and Lake Zurich, facing Starbucks. Plenty of free, on-site parking is available in the surrounding strip mall lot. Whether you’ve been here before or are a parent searching for same day emergency dental care for your child, our team of board-certified pediatric dentists has a provider on call 24 hours a day, 7 days a week. Contact us right away and we’ll arrange to see you as quickly as possible or forward your call to a provider for immediate assistance.